Looking for the best collection site software? Well, stop fidgeting and spin by booth #1844 to receive a demo! 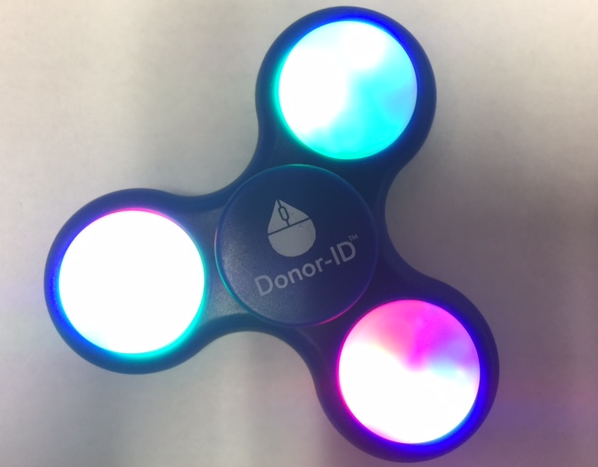 Buffalo Grove, IL, September 21, 2017 – Healthcare-ID, Inc. announced today that it will be giving away light-up fidget spinners to the first 50 people who stop by their booth at the 2017 AABB Annual Meeting in San Diego, CA, October 7 – 10, 2017. “AABB is a show we greatly look forward to participating in each year. We always enjoy the opportunity to talk with the attendees, as well as other vendors. And seeing that fidget spinners are all the rage these days, we thought it would be a fun giveaway for attendees,” stated Mary Lestina, Assistant Vice President - Special Initiatives. Hours of operation for the Annual Meeting are: Saturday, October 7, 5:45 pm – 8:00 pm; Sunday, October 8, 11:00 am – 4:30 pm; Monday, October 9, 10:00 am – 4:30 pm; Tuesday, October 10, 10:00 am – 2:00 pm. There will be V.I.P. demonstrations given by invitation only from 9:30 am – 11:00 am on Sunday, or 8:30 am – 10:00 am on Monday and Tuesday. Contact Bryan Sadorf to arrange your VIP session.